The stakes were pretty high when teachers took the stage Wednesday night at a school talent show and fundraiser in Beverly Hills. That's because the performers' day jobs were on the line. Out in the lobby, parents were holding a bake sale to raise money for the School District's "One" Campaign, which has the ambitious goal of raising a million dollars in just one week. It may sound far fetched, but this is, after all, Beverly Hills. "The economic problems are effecting us like everyone else," says parent Marjaneh Manavi. "We are in a bad situation like everyone else." Manavi, working in the lobby, is a parent of two children. She's trying to help save 12 positions, including teachers and counselors. Musical Theatre teacher Fred Pinto is one of them. 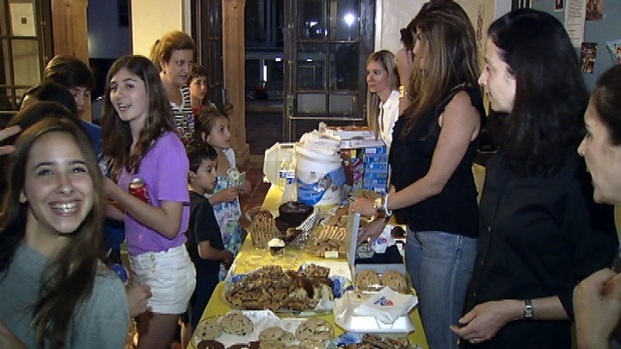 Beverly Hills school supporters are in the middle of a million dollar fundraising campaign. They might not make their target, but they're doing pretty well. "It's a matter of building creativity and expression and having a place for each student to fully develop and grow," said Pinto. "It's what a school should be about." Kindergarten through 5th grade technology teachers are also on the c hopping block in the affluent Beverly Hills School District. "These are really important positions and that's what makes our school district so special," adds Pinto. "I actually moved to this area to put my kids in school here," said parent Gene Avakayan. Every parent is getting a donation envelope that all parents are being asked to sign and return. The campaign started on Monday. By Wednesday night, fundraisers were closing in on a quarter million dollars. At this rate, they may or may not make their goal, but definitely get an "A" for ambition.